On the field at the most ambitious indigenous sporting event in Colombian history. The shaman had been at it since early Saturday morning—burning incense and puffing smoke and chanting ancient prayers to deities all but forgotten. And by kickoff, at 10:00 am, the ritual seemed to be working. Cold white fog was still billowing down the Andes’ Cordillera Oriental, but the rain had mostly stopped. As the teams took the field for the first ever National Indigenous Soccer Championship final, the skies above the former Muisca chiefdom of Bacatá were finally beginning to clear. Unfortunately, the former Muisca chiefdom of Bacatá is now the Colombian capital of Bogotá, and the shaman is no more capable of doing away with the permanent haze of rust-brown smog than is the city’s corrupt bureaucracy. The Spanish arrived here, on this misty high-mountain plateau, in the 1530s, searching for El Dorado—which has since become the name of Bogotá’s preposterously incompetent international airport—but there is very little golden or mythical about the sprawling ad hoc megacity that has grown around the colonial settlement they left. With its oppressive concrete and ubiquitous squalor, Bogotá may seem like a strange place to hold this tournament, the most ambitious indigenous sporting event in Colombian history. But the National Indigenous Soccer Championship does not deal in stale museum caricatures of what being indigenous in Colombia means or should mean. Some 160 players between the ages of 17 and 21 were brought to the capital for the tournament, most for the first time. And while each of the delegations had its own bit of “traditional” swag—straw hats and woven bags, a colorful headband or beaded bracelet—the prevailing style wouldn’t have been out of place in any of the thousand small towns throughout the country: elaborate jeans with bright, form-fitting t-shirts and knock-off Puma racing sneakers. Most of the players spent the opening ceremony WhatsApping away on their cell phones. Following the “cultural presentation,” a loosely choreographed, barefoot dance routine put on by one of the teams, the sounds of Romeo Santos, Pitbull, and Steve Aoki’s “Pursuit of Happiness Remix” played on the loudspeakers. Soccer in general, of course, is a decidedly un-indigenous sport—at least, in the sense that there were no shamans calling down blessings on the center circle in the Pre-Columbian era. And yet, for better or worse, soccer is as meaningful to these indigenous youth as it is to the rest of the country. The National Organization of Indigenous Colombians (ONIC), one of the preeminent indigenous political organizations in the world, recognizes the scope and utility of soccer as a cultural phenomenon. Gutiérrez, formerly the ONIC’s sport ambassador to Europe, told me that the tournament was the first major step in a larger pivot toward developing “a new generation of leadership.” Young people comprise two-thirds of Colombia’s roughly three million indigenous persons, according to Gutiérrez. The ONIC’s activism is well-coordinated across the local, regional, and national levels, but the long-term vitality of indigenous movements depends on establishing alternative spaces that engage the interests of their future leaders. By any measure, this initial experiment was a resounding success. Eighty-two of Colombia’s 102 indigenous peoples were represented in the Indigenous Championship’s lengthy regional qualifying process, according to the ONIC. The ten teams to make it through to last week’s group stages came from such far-flung enclaves as Colombia’s southeastern Amazon, northeastern desert peninsula, western Pacific jungles, eastern grasslands, and central Andes highlands. In a country of remote geography and pronounced regionalism, the Indigenous Championship was a truly national production. But ONIC’s vision for soccer as an organizing vehicle extends even further than Colombia’s neglected periphery. Twelve Latin American countries have already confirmed their participation in the first ever Indigenous Copa América, according to Gutiérrez. Colombia was originally slated to host the tournament, but organizers later made the strategic decision to move it to Chile, where it will take place in the immediate aftermath of the prestigious South American championship of the same name. The goal, as Gutiérrez put it, is to “visibilize our indigenous communities and the important issues they deal with.” So it helps that global soccer legend Carlos “El Pibe” Valderrama, whose iconic blond afro graced the early days of Major League Soccer, signed on last summer to coach Colombia’s first indigenous national team. He and his assistant, John Jairo “Pocillo” Díaz, a longtime Colombian pro, spent the week evaluating talent for the twenty-five-man final roster, which was announced after Saturday’s championship game and included at least one player from every team. Valderrama’s celebrity was the big draw of the Indigenous Championship, so much so that, at times, it threatened to eclipse the rest of the tournament. The constant barrage of autograph and selfie requests was to be expected, and indeed, the players, coaches, and organizers took more advantage than anyone. But whatever media attention Valderrama’s presence attracted was focused almost exclusively on him and his thoughts on what the press began referring to as the “conventional” national team. Did Radamel Falcao make a mistake going to Manchester United? Why isn’t Chelsea’s Juan Guillermo Cuadrado starting yet? How great has James Rodríguez been at Real Madrid? Can we beat Argentina this summer? Between Valderrama’s two formal press conferences, I counted a total of five questions about the Indigenous Championship itself. Valderrama could have done more to keep the coverage on message, but his participation was still a powerful driving force behind the event, and his commitment seems genuine. (Neither Valderrama nor the ONIC would disclose how much he is being paid for his services.) In a less guarded moment, he told me that he felt a “responsibility” to get involved. The consistently high quality of play at the Indigenous Championship only reaffirmed that faith. Those few players who’ve managed to enter Colombia’s youth development system told me that many others could easily make the leap. From the sidelines, Valderrama, Díaz, and the rest of the coaching staff debated the handful of players they believe already capable of becoming solid professionals. With a few well-placed calls from El Pibe, it’s not hard to imagine that Colombian soccer will soon get its first meaningful infusion of self-identifying indigenous talent. But to say that what’s holding back indigenous soccer is a lack of opportunity is to mistake, or at least gravely understate, the true nature of the problem. No, indigenous communities don’t have the necessary access to equipment, facilities, or formal technical training to build a reliable athletic pipeline. But those deficiencies are only symptomatic of the totalizing exclusion and abuse that characterize indigenous life. With creativity through the central midfield and pace down the wings, the Wayuu finished fourth in last week’s championship, sending four players to Valderrama’s national team. But back in the department of La Guajira, where the Wayuu make up almost half the population, infant mortality and malnutrition rates stand at more than twice the national average. El Cerrejón, one of the world’s largest open-pit coal mines, swallows 7.1 million gallons of water a day. Meanwhile, dozens of surrounding Wayuu communities endure acute water shortages and outbreaks of related diseases. Further down the Caribbean coast, in one of the regions hardest hit by Colombia’s right-wing paramilitary death squads, the Zenú, whose team was the tournament’s eventual runner up, find themselves protesting a different megamine. Reports that particle pollution from the massive Cerro Matoso nickel mine are responsible for a number of disturbing health epidemics in the region have circulated for years. In 2013, an academic study essentially confirmed that grossly elevated toxin levels put communities at high risk for everything from painful skin rashes to cancer. Dangerous contamination was found, for instance, in the tall grasses used to make the region’s famous hand-woven sombrero vueltiao, like the one Victor Contreras, the tournament’s leading scorer, wore in-between games. A number of Zenú leaders who’ve opposed the mine and other economic projects, Gutiérrez told me, have received death threats from the so-called “paramilitary successor groups” that emerged following the sham demobilization of the mid-2000s. Variations on these themes recur throughout the country. During the last half-century, settlers hunted nomadic indigenous peoples for sport on the plains of Casanare, which produces among the highest oil and gas royalties of any department. Today, chronic starvation is slowly finishing off the job, players from the department told me. As many as five different languages were spoken on the Vaupés bench. But several of the indigenous peoples from the department, the ethnically richest and economically poorest to send a team to the tournament, have less than fifty surviving members. As various resource extraction interests advance into the Amazon, the Vaupés coach, a longtime political organizer once kidnapped by leftist guerrillas, told me these communities will likely die out in the coming years, taking their cultures and knowledge with them. According to a 2012 report, twenty-three of Vaupés’ indigenous peoples are staring down a similar prospect. Fifty-six indigenous peoples in Colombia’s greater Amazon region have less than 500 total members, the same report claimed. That communities living under these conditions fail to produce professional soccer players is not simply understandable, it’s also largely besides the point. In 2014, the United Nations’ human rights representative in Colombia warned that mining has placed forty of the country’s 102 indigenous peoples at immediate risk of extinction. In 2009, Colombia’s Constitutional Court ordered emergency protection measures for over thirty peoples it found to be in a similarly desperate state. To date, the government has flaunted the court’s ruling, which the ONIC considers insufficient, regardless. The ONIC’s hope is that soccer will provide an alternative to at risk-youth. (I asked if any equivalent efforts would be directed specifically toward indigenous women, who have experienced unique hardships because of the armed conflict, in particular, and also endure the deeply rooted sexism of some of their cultures. Gutiérrez said programs would be considered, but did not elaborate on what form they would take.) But the ONIC’s understanding of risk is more nuanced than the broader political discourse’s. Gutiérrez insists that thirst and hunger kill more indigenous children than the easily sensationalized armed conflict. ONIC organizers cite the athletic accomplishments of Afro-Colombians as one of the influences for their new youth-centric undertaking. The lesson to be learned there, however, is as much cautionary as inspirational. Even a quick survey of Colombia’s celebrated 2014 World Cup team reveals the limitations of sports as an end of social justice, rather than a means. Jackson Martínez, Juan Guillermo Cuadrado, Pablo Armero, Carlos Sánchez, Victor Ibarbo—these world-class athletes come from some of the most places in Colombia. There is not a Colombian alive to see it who doesn’t remember Valderrama’s brilliant last minute assist to Freddy Rincón to tie West Germany and advance past the group stage of the 1990 World Cup. But during 2014, twenty-six dismembered corpses were found in Rincón’s hometown of Buenaventura, the overwhelmingly Afro Pacific port city being torn apart by extreme poverty, drug violence, and the aggressive free trade expansion projects now fueling both. Systems of Afro and indigenous oppression in Colombia are largely indistinguishable, especially given that the respective communities often occupy the same physical and cultural spaces. Riosucio, the municipality that produced the winning team of Caldas, is known for its legendary semi-annual Carnaval del Diablo—Devil’s Carnival—a festival that traces its origins to a 19th century peace accord between neighboring Afro and indigenous mining communities. (Riosucio is less known as the site of the 2001 torture and assassination of the ONIC’s founder, in a paramilitary massacre that claimed the lives of six other indigenous men and displaced 380 people.) One of the Caldas players to make it onto the national team roster is himself Afro-indigenous, as were a number of players from other teams. The argument can be made that indigenous, Afro, or Afro-indigenous progress on the soccer field is inherently subversive to those common systems—that the Indigenous Championship was itself a radical political statement. Just as likely, however, is the possibility that indigenous soccer will be seamlessly appropriated, another cultural commodity to be chewed up by a capitalist machinery geared toward the extraction of indigenous wealth and the destruction of indigenous bodies. “When they want to take advantage of your image, then they say, ‘Yes, we have indigenous people and we’re one of the ethnically wealthiest countries in the world.’ But the reality is that indigenous peoples are in a state of structural abandon…much worse than misery…And it’s not that we’re poor so much as that we’ve been made poor throughout history,” said Gutiérrez. The ONIC is not waiting to find out whether that pattern will hold with soccer. Plans are already in the works to build off the momentum from the Copa America to create meaningful athletic infrastructure on the local level that can later serve as a framework for social and political organizing. 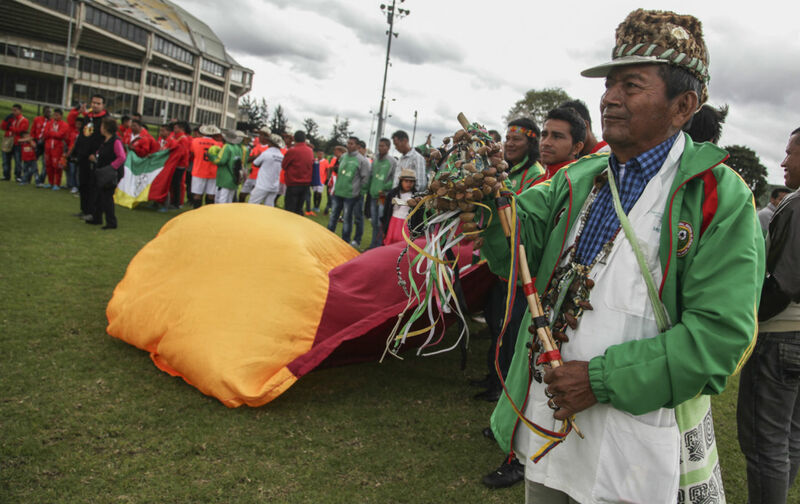 “Más Allá del Balón,” beyond the ball, was the slogan of the Indigenous Championship, and players discussed their interactions in Bogotá, and throughout qualifiers, in terms of solidarity and lasting kinship. Steven CohenTwitterSteven Cohen is an independent journalist based out of Medellin, Colombia whose work has appeared in the New Republic, Vice, ThinkProgress, and Colombia Reports, where he was formerly an editor.